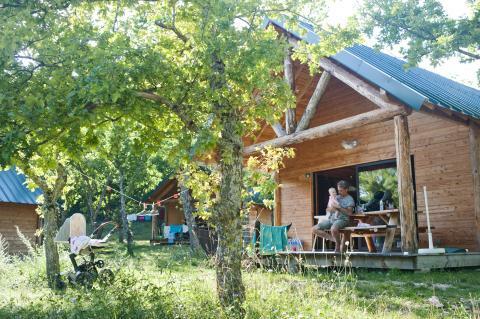 Huttopia Village Sud Ardèche in Vagnas - the best offers! 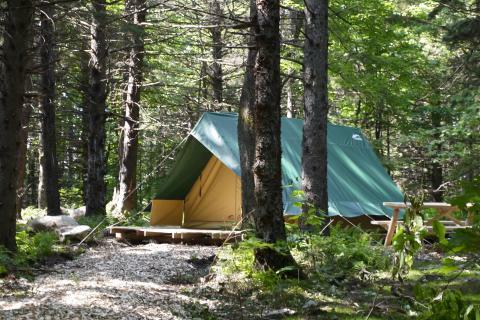 This price applies to 5-person tent Canadienne, with the arrival as 2 May 2019, 3 Nights. 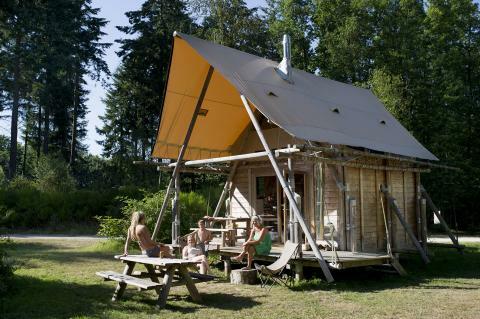 This price applies to 5-person tent Trappeur, with the arrival as 11 June 2019, 3 Nights. 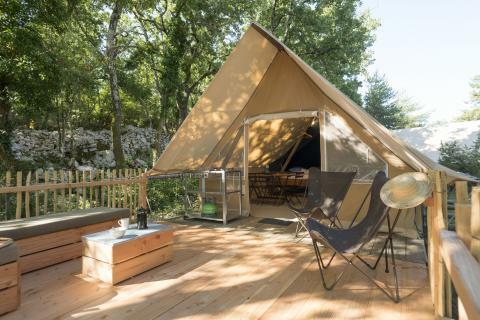 Village Huttopia Sud Ardèche offers luxurious wellness facilities and exciting activities accompanied with scenic views, all guaranteed to let you relax and disconnect from the world. 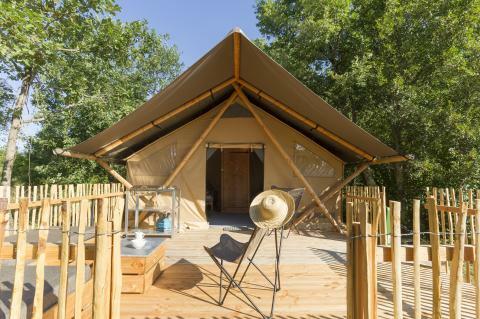 Guests at Village Huttopia Sud Ardèche can take advantage of their leisure facilities including their 2 pools, 1 of which is heated, and a paddling pool for toddlers. Perfectly disguised among the trees are the saunas in wooden cabins. A Finnish bath and sun loungers are also part of the leisure facilities, all of which are only reserved for adults. For an energetic option, a variety of activities take place during the summer such as origami, basketry, and electric scooters. For a more relaxed evening, you can choose to unwind at the open-air cinema, storytelling evening, or the wooden games evening. Children aged 6 to 12 get to be accompanied by a professional bilingual (English and French) guide during morning and afternoon hours. A program is prepared for them which includes fun activities such as treasure hunts and giant Cluedo. These guided programs take place everyday in July and August, and every weekend outside the summer. Village Huttopia Sud Ardèche has its own restaurant where you can dine and enjoy the view of the evergreen surrounding. During the summer, fresh pizza from the pizza oven is available. If you prefer to have ready-made breakfast, you can request this the night before at the reception. There is also a bar located at the campsite where you can not only get a drink, but also some ice-cream or crêpes for a quick snack. Self-catering is available on the terrace for those who want to enjoy a family-cooked meal with groceries bought from the different markets in the area. While at Ardèche, a must-see attraction is the natural bridge of the Gorges de l'Ardèche (5km) which is a popular spot to go canoeing or swimming while you enjoy a family picnic at the beach. You can also plan a day out to the Ardèche markets so as to ignite your taste buds with their specialties such as chestnut cream and their selection of wines.